The Vancouver detached market remains relatively sluggish. This follows a similar trend which you’re well aware of if you read August Detached Report. On a year over year basis you could say sales rebounded, however, when looking at it from a more macro level, detached sales remained well below ten year averages. Detached sales increased on a year over year basis in all areas. However, this comes after a foreign buyers tax which plunged sales to near record lows last year. For example, Vancouver (East & West combined) sales increased 31% year over year, yet were 32% below the ten year average. 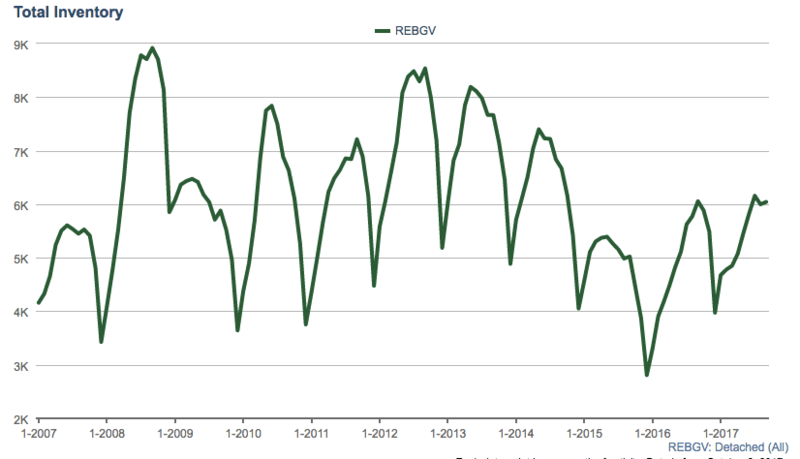 New listings surged across REBGV. Rising 10.5% on a year over year basis and 11% above the ten year average. New listings are trending above the ten year average for all areas. Inventory remained virtually unchanged, dropping 0.2% on a year over year basis. While inventory levels remain stable, they are still sitting slightly below normal levels. Similar to the last few months, most areas are in what’s considered a buyers market based on a sales to actives ratio below 14%. While the average sales price for REBGV is technically up 8% on a year over year basis (comparing September 2016 vs September 2017) there’s been virtually no price growth on the typical detached home as you will note with the 3 month rolling average (red line). Overall the detached market seems to be performing ok. However, with the sales to actives ratio now indicating a ‘buyers market’ for the past few months, combined with falling sales and increasing new listings it is putting some downwards pressure on prices. Buyers have more choices and are choosing to be patient, however sellers are also remaining relatively firm on prices. Overall, a pretty flat market with not a whole lot going on. The detached market appears to be in almost ‘limbo’ mode.